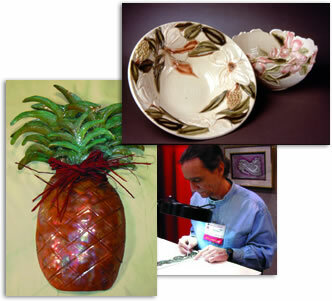 The Craftsmen's Classic organization was founded 35 years ago by the Gilmore family of Greensboro, NC. Clyde Gilmore, a jewelry maker, wanted to create a "family" of artists and craftsmen, nationwide, that could stage indoor festivals showcasing their totally original works and interact one-on-one with the public. The first such event, the "granddaddy" and prototype of all the others on today's schedule, was the Christmas Classic, Thanksgiving Weekend, at the Greensboro Coliseum. There are now 10 Craftsmen's Classics held annually and throughout the year in Columbia and Myrtle Beach, South Carolina; Richmond, Roanoke and Chantilly, Virginia and Greensboro, North Carolina. Produced by Gilmore Enterprises, Inc., headquartered in the city of Greensboro, the organization is managed by the late founder's son, Executive Director Clyde Gilmore III, one of the crafts and fine arts industry's most acclaimed and award-winning promoters. The Classic events have been named more often than those of any other promoter to the "200 Best" list by the prestigious Sunshine Artist Magazine and have been named often as "Top 20 Events" by the Southeast Tourism Society. Gilmore can also calculate success by the longevity of the Classics -- most of which are in their 15th to 25th year or more -- and by the tens of thousands of visitors that eagerly anticipate them and attend, year after year. The hallmark of the shows, from the beginning, is creative excellence and absolute originality in every specialty. Clyde and his wife, Tami, design each Classic with a fine balance of crafts and fine art and the specialties within those areas. There is careful thought given to a balance of traditional and contemporary works as well. More than 6,000 of the country's finest artisans are members; depending on the size of the facility, there are between 300 and 550 participants in a Craftsmen's Classic show. If you are interested in information on becoming an exhibitor, please click here. For more information on any of our Craftsmen’s Classic Arts & Crafts Festivals, please click on the individual show links below.